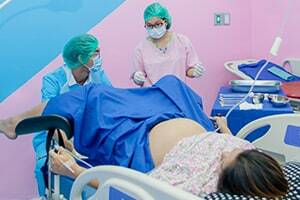 Doctors in the labor and delivery room will often utilize birth assistance tools such as forceps and vacuum extraction pumps to facilitate a difficult vaginal delivery. A delivery with the aid of birth assistance tools is referred to as an "operative vaginal delivery." Although operative vaginal deliveries are often necessary, they present a much higher risk of birth injuries. This is particularly true with forceps which have a higher rate of injury compared to vacuum extractors. Obstetrical forceps are a tool used by OB/GYNs to grip the head of a baby and help maneuver them through the birth canal. Forceps look like a pair of large pliers with curved cups on the ends. The cups are designed to grip the exposed head of the baby during childbirth so the doctor can then guide the baby through the birth canal by the head. When Should Forceps be Used? Prolonged Labor: prolonged labor is typically defined as when the pushing in the 2nd phase results in no progress after 3 hours. Fetal Distress: non-reassuring fetal heart rates and other signs of fetal duress may prompt doctors to use forceps, but this is only appropriate if forceps delivery will be faster than an emergency C-section. Maternal Fatigue: when a mother has become physically wiped out after prolonged pushing, doctors will sometimes use forceps to facilitate delivery. All of the indicators for use of forceps described above are somewhat controversial because they could also be described as situations that call for an emergency C-section as the more appropriate response. In fact, there is quite a bit of research evidence to suggest that emergency C-sections are a much safer alternative to using obstetrical forceps. The results of a study published in the 2018 in the Canadian Medical Association Journal clearly indicate a higher rate of injury with forceps delivery compared to C-sections. How do Forceps Cause Birth Injuries? Obstetrical forceps can be an effective tool for facilitating a difficult vaginal delivery. The problem is that using forceps correctly requires a very high level of skill and experience on the part of the doctor. Once the forceps grip the baby's head, the margin for potential error becomes extremely small. If the doctor grips the baby's head in the wrong way or uses slightly too much pressure, forceps can easily cause extensive damage to the baby's head. Unlike vacuum extractors, obstetrical forceps can be used to twist the baby into position. This is a very difficult maneuver and if not done perfectly it can result in devastating injuries to the spinal cord as well as head and brain injuries. Hematomas: a hematoma refers to an abnormal pooling or buildup of blood or fluid in or around the brain. There are 2 different types of hematoma injuries commonly associated with the use of obstetrical forceps: subgaleal hematomas; and cephalohematomas. A subgaleal hematoma occurs when emissary veins which cover the outside of the brain and head the skull and brain are damaged by external force (such as pressure from forceps). The external trauma is significant enough the emissary veins will actually break or rupture. Emissary vein ruptures will resulting in a dangerous pooling of blood up in the delicate space between the skull bone and the scalp. Blood pooling in this area typically triggers swelling and a buildup of internal pressure around the skull. Unless the mounting pressure from the pooling blood is alleviated it will eventually result in damage to brain cells. When a newborn baby is diagnosed with a subgaleal hematoma there is a very high likelihood that it is the result of birth assistance tools such as obstetrical forceps. Cephalohematomas are a similar but less serious type of hematoma. Cephalohematomas are also caused by a buildup of blood but the is occurs in a different part of the head/skull than a subgaleal hematoma. The particular location of cephalohematomas tends to restrict and limit the buildup and spread of pooling blood thereby reducing the likelihood of damaging the brain. Hydrocephalus: hydrocephalus is a somewhat different type of internal brain injury that is also characterized by fluid buildup. Instead of blood, however, hydrocep serious type of injury that occurs when external head trauma causes swelling which blocks the circulation of cerebrospinal fluid (CSF) out of the brain ventricles. The blockage causes CSF to accumulate within the brain causing dangerous internal swelling that often results in permanent damage to the brain. Intracranial Hemorrhage: neonatal intracranial hemorrhage (or brain bleeds) occurs when blood vessels around the head a ruptured causing internal cranial bleeding. Intracranial hemorrhages are similar to hematomas but they occur in somewhat different locations within the head and brain. All of the brain / head injuries described above have the potential to cause long term neurologic injuries to brain cells which can potentially result in permanent disabilities such as cerebral palsy.